Earlier this week I wrote about beauty, including my best skincare tip. I shared a photo that my husband had made into an art print. I love that photo, because it's mostly about the part of me that's pretty--my red hair. There's another part of me that's not at all pretty. In fact, it's ugly. I've written about this a little before, but mostly I try not to think about it too much. A couple of weeks ago I was reminded of it rather starkly. Every spring, when the weather turns warm and I start wearing dresses or shorts, it happens. This time it happened at church. A very kind man rushed up to me and asked, "Were you hurt?" He asked that question because of my birthmark. There's no way to sugar-coat it. My birthmark is ugly. It can't be removed, even with sophisticated lasers (I've tried). It can't be covered with make-up (I've tried). It can be hidden, of course, if I never allow my legs to show. I've tried that, too, but that's not really the way I want to live my life. So the only real option is to deal with the ugly. Over the years many people have said to me, "Oh, you should realize that your birthmark is beautiful, because this is just how God planned for you to be." I don't believe this is true. My birthmark is part of a rare disease called Klippel-Trenaunay Syndrome, and disease was not part of God's plan for us when he created everything. Disease entered the world after Adam and Eve chose to sin against God. What is true is that God is in charge of everything, and He did allow disease to enter the world. But there's quite a big difference between God's causing something to happen and His allowing something to happen. 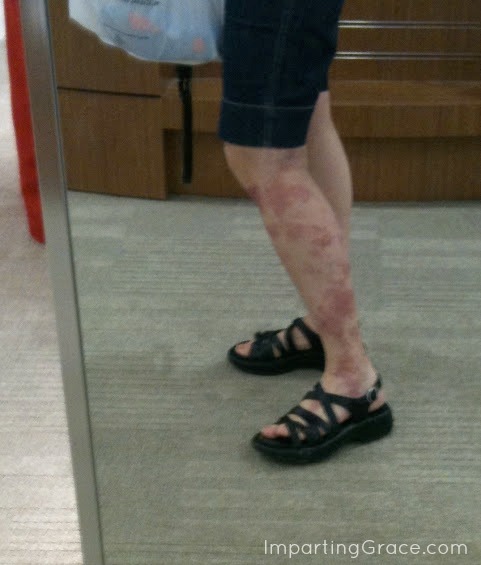 God did allow me to have Klippel-Trenaunay Syndrome, and with it this birthmark. And one thing I know for sure about God is that if He allows something to happen, He wants to redeem it. He can bring healing and beauty into the most difficult of circumstances. God loves me. The whole package of me, God loves. that God is light, and in Him is no darkness at all (I John 1:5). God loves all of me, the pretty and the ugly. Just as He loves all of you. Do you have a story that includes both the pretty and the ugly? I'd love to hear it! I don't have a story. All I want to say is that I admire you so much--you are so brave. Well in spite of your birthmark, He gave you a beautiful face and a wonderful spirit, a great life, and quite a few handsome men!! God just gave some ladies on the planet an extra dose of gorgeous. And you are extra-gorgeous. Inside and out. Oh boy do I ever. In fact I'm debating on sharing my whole story on my blog. It would mean opening up a part of me that I usually keep very private. Something is pulling me towards opening up though. You are inspiring me even more. Richella you are amazing, strong and beautiful inside and out. Thank you for your sweet friendship over the years. PS I do not see "ugly". Anyone who knows you would never see that. Thank you for being so honest and sharing your story. Sometimes I don't feel very "celebrity pretty" but then I am reminded that my husband and God both love me for me. Not just what's on the outside but the inside too. We are made in the image of God and while our lives are stained with sin he sees us as beautiful. Such a great comfort for me. I like how Melissa said it... I don't see ugly! I have only known you a relatively short time and all I see is loveliness everywhere! Good word on the realities of living in a fallen world. I am sorry that you have to deal with this, but love your honesty. Thank you for being so honest and open Richella. You are such a wonderful example of a beautiful woman! My 14 year old son has a birthmark just like that that goes from his right foot all the way to his stomach. He is tormented about it every summer at the pool. God has blessed him with a strong sense of self worth so it doesn't bother him as much as it does me. Thanks for sharing that picture, I showed him someone else knows how he feels. OK, don't laugh at me, but the first thing I noticed when I looked at the picture was the fact that you have great legs, (like, "she must be a runner" great legs) then I noticed your sandals, then I noticed the birthmark. I think anyone who is around you and your beautiful spirit (and your gorgeous hair, beautiful face and hot legs) would cease to see that mark in a matter of minutes. I love that you have learned to accept that the birthmark/disease is part of who you are. Maybe not part of God's plan in the beginning, but the price we all have to pay. But in turn you where blessed with beautiful hair and a gorgeous face. But most of all a very strong faith in God - and that will get you further then a perfect pair of legs! I see a woman with gorgeous red hair and a beautiful smile. Not making light of your birthmark as I know too well how cruel/rude some people can be. I really noticed the sandals first - true story. Everybody has some cross to bear. Looks like you are dealing with it head on, with a lot of common sense and praticality. plus, as another reader says, you have a lot of other great things to balance it out! Wish my legs were that slim, honey bunch. Richella, I didn't know about your birthmark before now, but I have seen the beauty of your spirit. It's really quite obvious and infectious- through your blog and even when I met you briefly at Blissdom. I'm suddenly very humbled to be so critical of my own appearance. Thank you Richella. Richella, you are beautiful both inside and outside! Thank you for sharing this Richella. Your honesty is the thing that I find most refreshing about your blog. I suffer with severe rheumatoid arthritis but I consider myself lucky. I just think there is always something to be thankful for. Thank you for sharing this, Richella--needed to hear that today! Richella - this is a beautiful and brave post. Thank you. And your earlier commenter is right on target - that's a great pair of legs you've got! I don't have a birthmark, but i was born with a not-pretty skin condition called icthyosis which is ugly and occasionally painful. 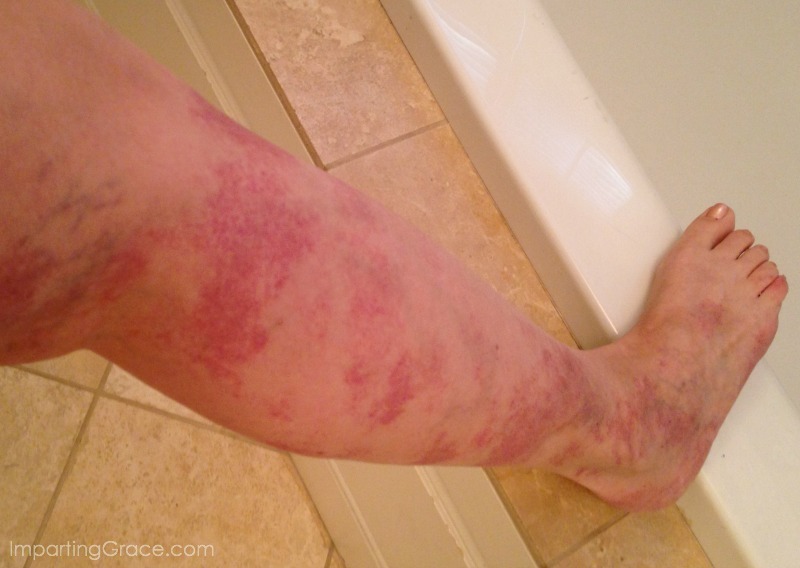 Excessively dry skin resulting in fish-scale-like stretches across my calves and back. I itch almost all the time - unless I go to a tropical climate like Hawaii or the Caribbean, where I feel comfortable in my own skin - a rare and lovely sensation for me. And I absolutely agree with you - this is not something God caused - it is the result of a broken creation and broken humanity. Yet it is part and parcel of who I am and I am slowly learning to know that God loves me exactly.as.i.am. Thank you for this post - and this invitation to share our own 'birthmarks,' for indeed - we all have them. I just found you through the Networking Blog May 2o and I'm so glad I did, my sister in Christ. I chuckled when I read you're an apprentice to Jesus; I read somewhere of God "When you're my apprentice you never get fired." I also have numerous chronic illnesses, though invisible, they cause different issues--people can't see a reason for a wheelchair so they often think I'm faking. Looking forward to getting to know you. Your post brought tears to my eyes. What a wonderful way to view what you can not change. My only grand daughter is a beautiful fair skin, freckled face, curly-blonde little girl ... With birth marks similar to yours. She has only a small spot above her eye brow, but large birth mark on her back. When I look at it, I am often sad because I know how mean some people can be and I would want to protect her from that. I will save this post to show her for the pre-teen years that are soon approaching. Your post was a blessing to me. You are so blessed to have such a sweet husband who obviously lives you very much. God bless! God sees you completely different than the world does. We see marks that make us uncomfortable. But God sees his child....beautiful in His eyes! And you are Richella.....just beautiful....red hair and even with red birthmarks.....You are His creation and He must be extremely pleased! Thank you for sharing something that is probably very painful for you. We all have "marks" of some degree. You have certainly not let yours rule your life. How I admire you! You are absolutely beautiful! God doesn't see ugly, and neither do I. I see a beautiful heart and spirit of a woman who loves the Lord and others. I love that you share this with us. You are beautiful both inside and out. Stopping by from the blog hop networking party!! Thank you so much for sharing this post. I struggle with accepting the ugly a lot and this was sooo something I needed to hear on a Monday morning starting my week!! Thank you!!! Best wishes and happy blogging!! Thank you for sharing. You are truly beautiful - inside and out. Thank you for this beautiful truth, Richella. I had forgotten about your birthmark, but now that I'm reminded of it, I still don't "see" it when I think of you. Just your beautiful spirit. Okay, and your hair. And smile. And skin. :) Love you! Thank you. There is such wisdom in this post. I needed to read it. You are lucky that you have got legs, please don't think that it is ugly. Hello. Thanks for that post as it has got me thinking about how it is so easy for us to compare ourselves to the "icons" of this world. Be it the women on tv or the skinny models on the magazines. However when we try to live up to the icon that Christ has set for us, beauty and whatever definition that means, starts to take a backseat to a life filled with serving Him. I am sorry you had to go through the emotional pain associated with that birthmark, but living your life to the fullest, unfettered by the restraints of the birthmark, is a true icon to your children and those around you about what is truly important. Wow what an inspiring story you shared. I admire you for that. I, as well as many others, noticed what great legs you have first. Probably because I, myself, have birthmarks as well. A condition the doctors called bathing trunk nevus. They are the dark hairy birthmarks that cover a big portion of my body. It stretches from my shoulder blades down my back to my bottom and then over across my stomach where it comes just inches from touching. Then I also have what they call satellites, which vary in size and are just birthmarks over the rest of my body. I have a rather large satellite, bigger than my hand, on the inside of my right leg just above my knee. I try not to think of it as well. I tend to wear capris instead of shorts. As a child I was teased and people called me dirty because they thought it was mud/dirt. I have a wonderful husband who has made me feel beautiful and forget about them most of the time. God loves me and my beauty marks, and he will never give me more than I can handle. I smile every day even when I think no one is watching because I know God has a plan for me(so far it's been helping other people deal with tough times which is why I believe I was pulled into the direction of nursing). Keep smiling and showing off those great legs. Thank you for your story. I don't have a birthmark, but have scars from a mastectomy and from removal of my thyroid, scars where I had a port and scars from drainage tubes. Some unusual lumps and bumps from reconstruction and another scar on my back. Occaisonally I look and wonder where my pretty body went! But you are so right: God loves me, and what's more, some day I will have a resurrection body in heaven! Now I have to deal with other's comments, but I pray that I can be an example of Christ to them. It's amazing what God can use to draw us closer to Him! I thought it was interesting that both your favorite and least favorite things on your body are red....a color I don't have on my body anywhere. The color symbolizing the blood that was shed for us. I liked what someone above said about us all having a "birthmark" of some kind. It's so true! And I am so glad you have learned so much from yours. Isn't God wonderful! Richella, I actually stumbled across your blog. Or should I say I was directed to you! See I was searching online for ways to "cover up"my birthmarks that are exactly like yours. However God wanted me to read about your struggles that are exactly like mine and realize that I need to "accept" my birthmarks and learn to feel beautiful with them. I'm 44 and it was only last summer that I wore capris, not shorts. I'm not that brave yet. However, I'm inspired by you to be brave and wear shorts this summer! Of course I know I'll get some strange stares, comments and questions so I will equip myself with some scriptures to keep me strong. Here's the crazy thing..... I totally understand why people would stare and be courious. I catch myself staring at people who have birthmarks that cannot be hidden?? Not to judge, but I wonder what their life has been like. Have they been deeply affected like me? I've never seen anyone in person with birthmarks on their leg like mine and yours. I've only seen port wine stains on faces and arms. I think that's why people look at us in a strange way. It's not seen very much, so people think it's a burn, bruises, disease, etc. Richella, thank you for sharing and for being so open about your life and your struggles. More women should be brave, and show their "imperfections". We can all inspire each other to live life full out and accept "differences" in all of us. Hopefully it won't take younger generations 30-40 yrs to accept themselves as they are. Thank you for sharing your awesomeness! I have a birthmark exactly like yours up the side of my leg also. I am only 15 years old and getting more interested into the dating world at my age, how did you find boys responded to your birthmark? I am very self concious about it and am afraid I won't be found attractive after people see it.